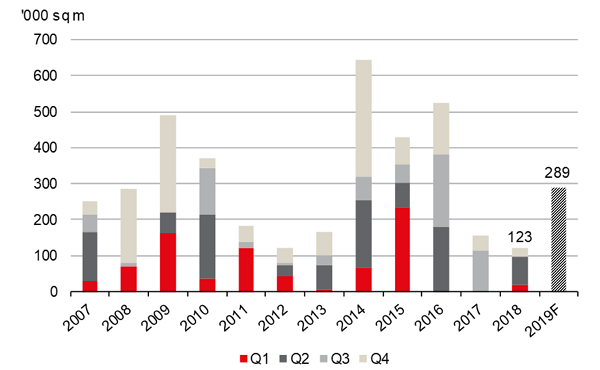 According to JLL, 2018 Moscow shopping centre completions amounted to 123,000 sq m, only marginally above the 2012 record low of 120,000 sq m.
The new 2018 supply consisted of Kashirskaya Plaza SEC (71,000 sq m), Milya in Zhulebino (19,000 sq m) and Petrovskiy SC (8,500 sq m) opened in H1 and two projects delivered in Q4, Arena Plaza SC (17,000 sq m) and Krasnoprudny SC (about 7,000 sq m). Low completions are the result of several postponements, including Ostrov Mechty SC, Rasskazovka TPU, Galeon SC, the second phase of Smolensky Passage MFC and several local ADG group schemes, all of which were initially announced for 2018. As a result, 289,000 sq m of new deliveries are expected in 2019. The dominant projects this year will be Salaris MFC and Ostrov Mechty SC, together accounting for 61% of forecasted completions. 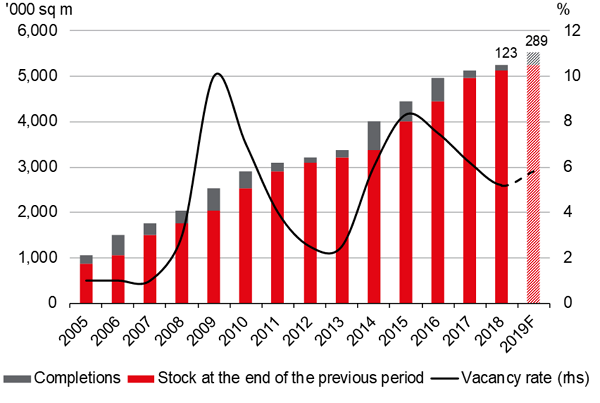 Because of low completions and a lack of available quality retail space the vacancy rate in Moscow has continued to decline, reaching a five-year low of 5.2%, 1 ppt down since end-2017. “The declining vacancy throughout last year originated mainly in such shopping centres as Mozaika, Riga Mall, Butovo Mall. Besides, occupancy improvements were demonstrated by new schemes, delivered after 2016. For example, in 2018 the Riviera SEC vacancy rate declined to 3% from 8%; in Vegas Kuntsevo SEC to 8% from 15%," – notes Oksana Kopylova, Head of Retail and Warehouse Research, JLL, Russia & CIS. Taking into account the expected completions in 2019, the vacancy rate is projected to rise slightly, to 5.8%. 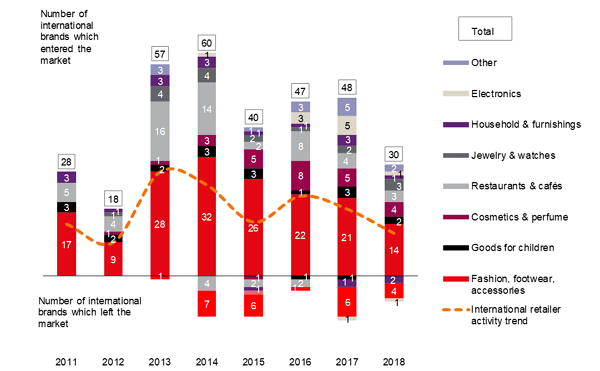 The inflow of new international retailers declined in 2018, with only 30 entering the Russian market against 48 in 2017. This marked a six-year minimum. Seven international brands left the Russian market vs nine in 2017. The majority of 2018 newcomers are representatives of the premium segment (53%), while in 2017 middle segment brands prevailed, with 46% of the total number. In 2018 the middle segment has accounted for 40% of debuts. Among prominent entries last year are mono-brand stores of That's Living, COS, Karl Lagerfeld and Coach. In 2019, a number of international brands are expected to enter the Russian market. American brand DreamPlay intends to open an entertainment centre in Aviapark SC. Chinese retailers such as fashion brand Urban Revivo and sportswear brand Li Ning are also expected to debut in 2019. In addition, fashion retailer Mеxx announced its return to Russia. This and other figures refer to gross leasable area (GLA).